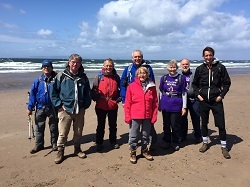 To help celebrate our 40th Anniversary, we launched our first ever Seaside Walk Week from 23rd – 31st May. 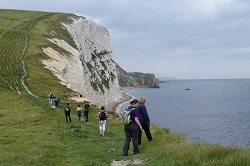 Guided walks took place in nine seaside locations around Britain with local families and children, holidaymakers and more experienced walkers, taking part. Participants learnt about famous landmarks, the history of the local areas and how the charity supports struggling families who are in desperate need of a break. Local Mayors and dignitaries attended various walks, greeting the walkers before they set off and meeting charity members. Every walk was met with sunshine, which lasted for the duration of each walk, reminding the walkers of the beauty of the British seaside. You can view the maps of the routes here. The aim of Seaside Walk Week was to raise awareness and engagement with a new audience around the country, and this proved a great success. Working with new partners such as Higgidy and Usborne Publishing, and visiting different areas with dedicated partners such as HF Holidays, YHA and First Great Western (now Great Western Railways), gave the charity a greater reach. Online visibility in new geographical locations and walking spheres were created, and charity presence in large, well-established digital communities such as Time Out London and Mumsnet were generated. This growth, combined with a significant increase in social media engagement, means that the first year of Seaside Walk Week has laid great foundations for the event for 2016. The walks served as a reminder of the thousands of struggling families around Britain we help every year to spend much-needed time together at the British seaside, where the trips are nothing less than a lifeline.